Ghost Controls Automatic Gate Opener Systems are now available at J&N Feed and Seed. 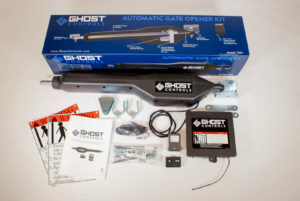 Ghost Controls Automatic Gate Opener Systems are the perfect do-it-yourself solution for any agricultural style or tubular gate used to access your property. These innovative gate opener systems were designed to be the superior solution for home and property owners wishing to automate their tubular or agricultural style gates while being the easiest system to install. Many folks utilize these systems in areas where AC power is not easily accessible. These systems have been designed from the beginning for solar power as the primary recharging source for the batteries. Extremely low standby power combined with external automotive style battery enables these units to be reliable solutions in installations that may not be frequently or easily accessible. Additional accessories can be added to customize your installation including a wireless keypad, vehicle sensor, or push-button. Stop by J&N Feed and Seed in Graham, Texas, for Ghost Control Gate Openers and all your farm and ranch needs. This entry was posted on Wednesday, March 15th, 2017 at 11:34 am	and is filed under News & Updates. You can follow any responses to this entry through the RSS 2.0 feed. Both comments and pings are currently closed.